64 • RV PRO • November 2018 rv-pro.com R V M A N U F A C T U R E R S She credits East to West's social media presence with helping attract retail buyers at the outset. Early feedback from dealers and consumers is they like the limited floorplans and standardization, Rees says. How the (East to) West Was Won The decision to build RVs was not a spur-of-the-moment one, but rather came after what she considers a diversified career. Rees, 36, graduated from Butler University in Indianapolis in 2004 with a degree in marketing. She moved to Chicago, where she spent the next 13 years in retail sales. Her experi- ence includes U.S. sales and brand manager for Esteban Paris, buyer for the Chicago Bears Pro Shop (part of Delaware North Companies) and marketing and project manager for Outsider Inc. For the past five years, she owned French Studio Imports, whose product was home fragrances, which she distributed throughout the U.S. and Canada. While her experience has been in retail, Rees says her intent was always to start her own RV company some day. Indeed, throughout her retail career, she often pondered how the les- sons she learned could carry over to the RV industry. 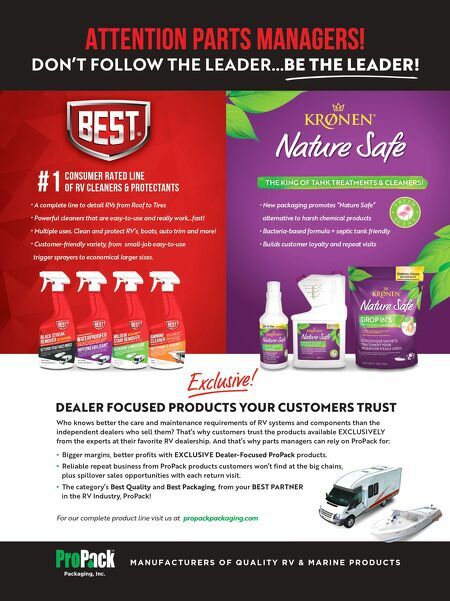 Rees says she developed valuable experience in purchasing abroad, sales, product development, multi-media marketing and developing distributorships – all key to running an RV company. She worked with retailers as well as consumers. She says she saw that when she reduced her line of fra- grances, it simplified the decision-making process for her customers, and her sales rose. That led her to think about the RV industry and how limiting floorplans and offering just one exterior color and interior décor could cut costs and improve the bottom line. From time to time, she would talk with her father about starting her own RV company, but not until two years ago did he begin to take her seriously. She broached the idea of shortening the product line in the RV industry and he thought the idea had merit, she recalls. "That's how the East to West concept came about." As she tells it, "I had been talking for years about doing my own manufacturing business. I had imported so many products that I wanted to be in charge of my own product development and manufacture something that I thought was sellable. 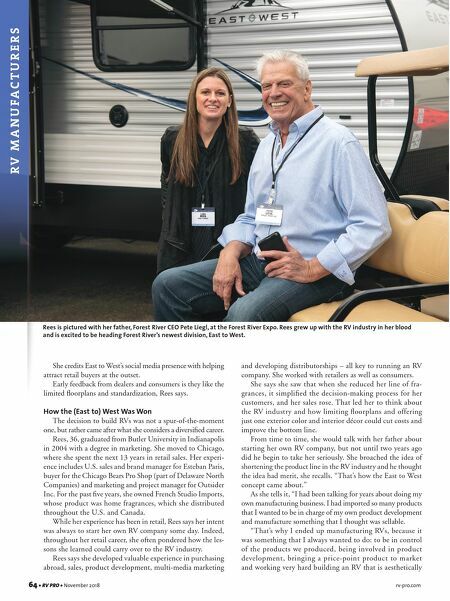 "That's why I ended up manufacturing RVs, because it was something that I always wanted to do: to be in control of the products we produced, being involved in product development, bringing a price-point product to market and working very hard building an RV that is aesthetically Rees is pictured with her father, Forest River CEO Pete Liegl, at the Forest River Expo. Rees grew up with the RV industry in her blood and is excited to be heading Forest River's newest division, East to West.